......and not the Cleveland Browns either! In 2002 the New York Department of Environmental Conservation (NYDEC) started stocking the Lake Erie shoreline with a domesticated strain of brown trout from their Rome, NY hatchery. That initial planting included 25,000 yearling browns and was primarily geared to impact Lake Erie boat fishing. These browns not only showed good survival and growth rates but surprisingly started fall spawning runs into numerous Western NY tributaries of Lake Erie (including Chautauqua and Canadaway Creeks) providing a nice bonus to the already excellent tributary steelhead fishing. Averaging 5-6 pounds, these lake-run browns are smaller in size to their Lake Ontario cousins which are also stocked by the NYDEC but benefit by a deeper, colder lake which is thought to produce older/bigger fish. In 2008 the NYDEC stocked 36,000 browns into Lake Erie’s Dunkirk and Barcelona Harbors, the mouth of Cattaraugus Creek and Big Sister Creek. The Pennsylvania Fish & Boat Commission (PF&BC) began stocking browns in the shoreline and tributaries Lake Erie in the early 80’s but discontinued the program as the steelhead stocking program took off in the early 90’s. Due to increased requests for browns by tributary anglers, boat anglers and charter boat captains, the PF&BC and local sportsman’s cooperative nurseries, are collaborating to resurrect the lacustrine (lake related) brown trout program in the heart of steelhead alley. The program will initially be started with certified disease-free, fertilized brown trout eggs donated by the NYDEC in the first 5 years. The egg source for these eggs will be a domestic inland brown trout strain from the NYDEC hatchery system. As the program evolves the PF&BC hopes to secure a self-sustaining egg source through the development of captive brood stock and perhaps the use of feral (wild) brood stock by collecting eggs from browns returning to Pennsylvania nursery tributaries. 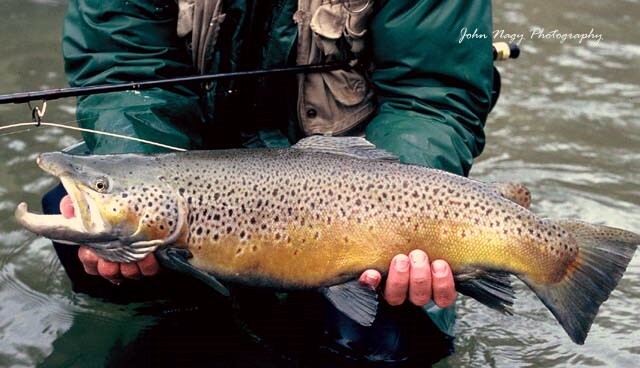 The first stocking of 35,000 yearling browns (8 inch size) was done in the spring of 2009 by the 3CU Trout Association at the mouths of a select number of nursery tributaries. In 2010 the 3CU and the Wesleyville Conservation Club stocked 50,000 yearling browns (adipose fin clip) with the PF&BC planning on stocking 50,000 yearling browns at the end of this September. Future annual brown trout stocking will be in the 50,000 to 100,000 range representing about 5 to 10% of the steelhead stocking levels in Pennsylvania. The PF&BC browns will be either right or left ventral fin clipped to provide information on evaluating stocking locations. Approximately 25% will be left ventral fin clipped and stocked into Presque Isle Bay with the remaining 75% right ventral fin clipped and stocked at the mouths of Trout Run, Godfrey Run, Orchard Beach Run and the nursery water of Crooked Creek. If stream flows are low in these tributaries, stockings will be done directly in the lake near the tributary mouth. These new brown trout plantings will replace the surplus steelhead stocked by the PF&BC since the elimination of the Coho salmon program in 2003 (bringing down yearly steelhead stockings from 1.1 million to 1 million in the Pennsylvania tributaries). Chuck Murray, Fisheries Biologist for the PF&BC, says that brown trout should do very well in the relatively warm Lake Erie since they prefer an optimal water temperature range of 65-70 degrees (Lake Erie boat fisherman have report good catches of 18 inch browns during this past summer). Also, since they tend to be bottom and structure oriented, they will have good forage base in Lake Erie’s prolific round goby populations which like to sit on the lake bottom (steelhead prefer to feed further up in the water column where rainbow smelt and emerald shiners are more prevalent). Steelheaders specifically targeting steelhead alley browns in the fall should expect the peak of the run in late October to early November with a few around as late as January. Look for them in faster runs and shallow pocket water areas. In the spawning mode, they can be particularly aggressive, and will actively take streamers, wooly buggers as well as egg patterns and nymphs. More detailed information on the brown trout and steelhead fisheries in Lake Erie can be found in John Nagy’s book “Steelhead Guide, Fly Fishing Techniques and Strategies for Lake Erie Steelhead”.